In the paper a new accuracy estimation method for Charef approximation was presented. 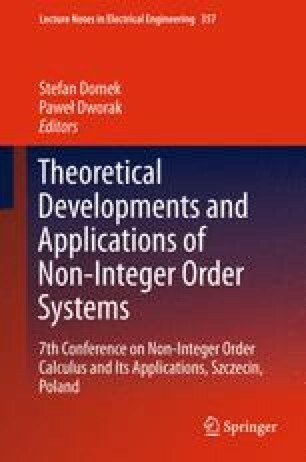 Charef approximation allows us to describe fractional-order systems with the use of integer-order, proper transfer function. The accuracy of approximation can be estimated with the use of comparison step responses of plant and Charef approximation. The step response of the plant was calculated with the use of an accurate analytical formula and it can be interpreted as a standard. Approach presented in the paper can be applied to effective tuning of Charef approximant for given plant. The use of proposed method does not require to know a step response of the modeled plant. The proposed methodology can be easily generalized to another known approximations. Results are by simulations illustrated. This paper was supported by the AGH (Poland)—project no 11.11.120.817.